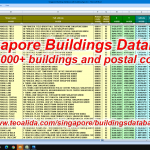 The HDB Database involve collecting data from multiple sources and typing it in one Excel table, an original compilation Made by Teoalida. The database has been purchased by several companies, including home insurance, telecommunication, door-to-door services, real estate portals, flyer distributors, as well as many people who did not told me what business field they are in. I offer 5 standard packages, containing block number, street address, building name, building type, building era, postal code, plus some specific details shown below. You can purchase a smaller package then upgrade to a bigger package paying difference. For custom packages or additional data that is not yet included in database, contact me! Instant download! Pay via PayPal or credit card and receive automatically an email with download link (example email). FREE updates every 3 months for one year! Pay 50% per year for next years! See also Terms and conditions! If you want to view data of ONE block instead of buying complete database, you can view for FREE on HDB Map. Bonus: number of floors and units per floor, building description, links to most common floor plans, SERS prediction by Teoalida. All details, purchase just your preferred towns! Price: 10 cents per building. If you purchase 3 towns, price will be 9 cents, if you purchase 5 towns, price will be 8 cents. Contact me for discount! Summary file does contain number of HDB buildings breakdown by type and number of dwelling units breakdown by flat type, for each HDB town, phase of development, town council and electoral division. Does NOT contain individual HDB blocks. Total number of tagged HDB buildings in database: 15092 (after Nov 2018 BTO update). Database include also few hundred non-HDB buildings (not tagged, not included in this count). Residential flats: 10779 + 1398 demolished (including blocks with shophouses and no flats). Multi-storey carparks (MSCP): 1106 + 4 demolished. Pavilions: 829 + 7 demolished. Other buildings: 649 + 105 demolished (commercial buildings, electrical sub-stations, etc). 1927-1960 (SIT era): 819 buildings. 1960-1982 (HDB classic era I): 3447 buildings. 1981-1993 (HDB classic era II): 3645 buildings. 1992-1999 (centralized refuse chute): 2100 buildings. 1998-2007 (household shelter): 1978 buildings. 2005-present (introduction of BTO scheme): 3053 buildings. Number of units is available for 10,645 blocks that were existing at least as 2010, including under construction blocks launched until November 2018 BTO. Total: 1,148,936 units, averaging 107.93 units per block. Every year, new blocks are completed while others are demolished, keeping this figure up-to-date is difficult. 1,047,350 dwelling units are in use as 31 March 2018 according HDB Annual Report. – Block numbers: complete for all Singapore. Source: www.onemap.sg. – Building name: complete for all blocks that have a name. Source: www.onemap.sg. – Street address: complete except blocks under construction and blocks demolished before 2000. Source: Enquire status of upgrading programmes. – Town / Estate: complete for all Singapore. Town is official zoning while Estate is my personal classification by phases of construction. – Town Council: complete for all Singapore. Source: www.onemap.sg. – Electoral division (GRC / SMC): complete for all Singapore. Source: www.onemap.sg. – Construction code & unit numbers: available for 3011 of 14586 total buildings, or 2464 of 2666 BTO era buildings. In 2016 a customer suggested adding unit numbers. Source: site plans from BTO and SBF brochures, available for 90% of BTO era blocks and for random pre-BTO blocks which HDB offered site plans at Sale of Balance Flats. I know how useful would be to have the unit number ranges for every block, but this is NOT POSSIBLE. Hong Kong does have www.centamap.com showing unit number and position. When Singapore is going to have the same? Going from block to block to check mailboxes and get unit numbers, takes more than a man’s lifetime. – Building type tag: complete. This column act also as filter, non-HDB buildings have it left empty, who wants a simple list of HDB buildings can filter it to delete empty rows (estate header row, schools, condos, etc). Flats / MSCP / Pavilion / Other + Demolished tags, so the real estate agents can filter and delete demolished buildings, while historical researchers (like myself) can keep them. – Postal codes: available for 12966 buildings standing as 2015 or under construction. Source: HDB Centralized Map. Personally not interested in postal codes, but in July 2014 a customer suggested adding them, a 2nd customer asked for postal codes in May 2015, so in June 2015 I added them. HDB Centralized Map added info boxes for under construction blocks in late 2016, allowing me to add in my database too at January 2017 update. – GPS coordinates, latitude / longitude: complete for residential buildings. Suggested by 1 people in 2013, too hard task to write coordinates manually, NOT in mood to do it, but DONE in 2015 thanks to Renata who bought my database and made a script to run in Google Maps API and add coordinates. In 2017 I met Sik Su Wei who made a script to get coordinates from HDB Centralized Map and I integrated them into my database using VLOOKUP function of Excel. – Lease commence date: complete for all blocks available on resale market (so NO year for carparks, rental blocks, or blocks within MOP). (30% done in 2010 and remaining 70% completed in December 2014, year only, source: HDB Resale Flat Prices.) Since 2015 I started to improve by adding month and day, sourcing from HDB Centralized Map. – Estimated completion date: complete for blocks under construction or under MOP: source: BTO brochures. When blocks fulfill MOP I replace estimated completion date with lease date. 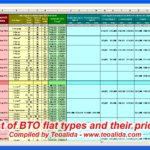 Update frequency: when new BTO are launched. Update frequency for above items: every 3 months when new BTO are launched. Also adding old demolished blocks when I discover them on hm.onemap.sg or National Archive photos. My ULTIMATE GOAL is to have in database all SIT/HDB blocks ever built. – Building year: available for 505 buildings. HDB never publish actual building date, except when the block is selected for SERS. I have indicated the building year in database only for SERS blocks and for the blocks who were leased significantly later than their actual construction date. The building year is sourced from old newspapers seen at National Archive (if possible), otherwise estimated using old Street Directories. – Demolition year: complete for all 1448 demolished buildings. Source: estimation using old Street Directories (1984, 1988, 1991, 1993, 1995, 1998) or Google Earth satellite imagery (after 2000). – Number of units (text form) & upgrading programmes: complete for residential buildings. Source: Enquire status of upgrading programmes for blocks completed as 2015. (25% done in 2010, remaining 75% ON HOLD waiting for a customer paying me…. been paid in May 2015 and completed in June 2015 (complete for all blocks that were standing to at least 2010). – Number of units breakdown by flat type in separate columns: complete for all residential buildings (about 9500 buildings). Idea used since 2011 for List of BTO projects. In 2014 I planned to use it in the future for HDB Blocks Database too. I decided in June 2015 to breakdown original number of units beside current number of units which is varying over time. (done in 2014 only for Jurong West for showing SAMPLE file. Breakdown done in all towns in June 2015). Since 2016 I add number of units when blocks are launched rather than when completed, source: site plans from BTO / SERS / SBF brochures. Note: number of units is VARYING over time in blocks with 1/2/3-room built up to 1990, due to people who buy 2 flats and adjoin them. Update frequency: I add number of units for new HDB blocks when new BTO are launched, but I will NOT offer updates for block built up to 1990, would take large amount of time to reached every block and benefits are insignificant. They will remain “as 2015”. – Number of floors, units per floor, estimated number of units: 40% done in 2009 estimated from shadow length in satellite photos, before Google Streetview introduction, may have errors +/- 1-2 floors, additional 20% done accurately in 2010 by counting blocks in Google Streetview. In 2014 I decided to complete database without number of floors because it was taking too much effort and I believed that it is no longer needed, precise number of units became available in HDB enquire status of upgrading programmes, no longer need to multiply floors with units per floor. In 2015 a customer (Renata, see her comment) offered me a BONUS of $400 to complete number of floors for remaining 40% of blocks, but after doing half of job she told me to STOP THE JOB because her boss don’t want to pay. I can resume the job and do remaining 20% if another customer is interested in paying a BONUS for completing number of floors. If do you want also to count the 40% estimated in 2009-2010, I can do if I have sufficient time, and you need to pay my time. Virtual Singapore, a very detailed 3D map, was announced in 2015 to be ready in 2017. In August 2017 it was announced that will be ready in July 2018. Virtual Singapore would have helped me counting floors easier and accurately than in Google Street View. In mid-2018 another announcement said that map will be ready in 2018 for government agencies while public access will be few years later. Meantime Google Earth launched 3D map for Singapore in August 2018 as it had for many other cities around the world. Even if not whole Singapore is available in 3D, I got interest to count floors, I used Google Street View where 3D map was not available, and by September 2018 I finished counting floors of 95% of HDB blocks! Anything else necessary? Your ideas are welcome! I started compiling data voluntarily in 2009, purpose: personal research about housing density in selected estates and use the results in designing own apartments, I abandoned in 2011 after completing 40% because it required too much effort for a non-paid job. Being a voluntary project done without any specific target, I changed my mind numerous times, making the database a MESS, table layout being different from town to town depending by the date each town was compiled. In 2012 I published on website a SAMPLE with one town, as marketing experiment, to see who (if anyone) is interested. I was willing to re-compile entire database, this time as PAID service for professional use. I hoped people to tell their requirements or suggest changes in data structure, negotiate a price based by amount of effort needed to compile the data, then do the job… but I was facing with lack of feedback, LAZY customers do not inform me exactly what data are looking for! Took 2 years to get a rough idea what people are looking for… and resumed working in July 2014, I done A LOT of changes in data structure, cleaned (most of) mess and standardized database format across all towns, completed whole Singapore in December 2014 in terms of block number, address and lease year. Number of units remained as done in 2011 (25% completed), the rest 75% will be done AFTER finding a customer willing to pay 50% before 50% after. The long-waited customer came in May 2015, work started, completing number of units for ALL 10,000+ blocks by June 2015! As customers requested, I added also postal codes in June 2015 and unit numbers in 2016, town council and electoral GRC / SMC in 2017. Total: hundreds hours of research and data entry work! I update HDB database every BTO launch (every 3 months), each update taking about 3 hours, plus other updates to add additional data (if new ideas comes in my mind). You can suggest your own ideas what other data to add! Read more: history (full story) & changelog. Are we able to get the floor area of void deck and common corridor/common area? You can estimate void deck area by measuring the roof in satellite photo (using Google Earth, not Maps) but beware that some blocks have shops or childcare centres that use part of void deck. Common corridor area is about 20% of block area. BTW, why do you need this unusual info and why do you post comment in this page about Excel database? This is off-topic! Howdy! I know this is kinda off topic but I’d figured I’d ask. Would you be interested in trading links or maybe guest writing a blog article or vice-versa? My website addresses a lot of the same topics as yours and I think we could greatly benefit from each other. If you happen to be interested feel free to shoot me an e-mail. I look forward to hearing from you! Terrific blog by the way! May I know how do I contact you? There is no mobile number listed here. Thank you for painstakingly collecting data and taking the time out to answer questions from the public, wanted to ask you for your thoughts are on the likelihood of SERS for blk 94 Havelock road (160094), my partner and I looking to move there to start our family and at least stay for 15-20 years, so we are looking for stability and not moving. There are a couple of factors that could be pro SERS such as a neighbouring empty land with a plot ratio of 4.0 based on the URA masterplan,and the neighbouring flats at taman ho swee are low rise (10 floors). However,there was a lift upgrading program about 10 years ago. what do you think? Why do you leave comments about SERS in HDB Database page instead of SERS Page? Block 94 Havelock Road is built in 1983 and currently only blocks built up to 1980 can be selected for SERS, whenever this rule may be changed, nobody knows. Understood, thanks for sharing your information and being helpful!